This month we were shown a number of finishes, as used by experienced club members, Ian Woodford, Alan Sturgess and Chris West. Ian started us off talking about pens and the materials and finishes that he uses. He turns pens out of wood, stabalised wood and acrylic. For regular wood Ian said that he likes a finish which absorbs into the wood, rather than one that sits on the surface. He showed us applying ‘padding lacquer’ which he said was like French polish. He applied a coat of this, then dried and buffed it, before applying a second coat which he also dried and buffed. At this point he recommended leaving it for 24 hours at least, before returning to apply a final coat. To illustrate the effectiveness of this finish he brought a pen, now 3 years old and in daily use, still looking great. In terms of general tips, Ian noted that finishing begins with the last cut you take with a sharp chisel (ideally freshly sharpened for the last cut) He also advocated sanding lengthwise along the grain to remove sanding rings between grits. 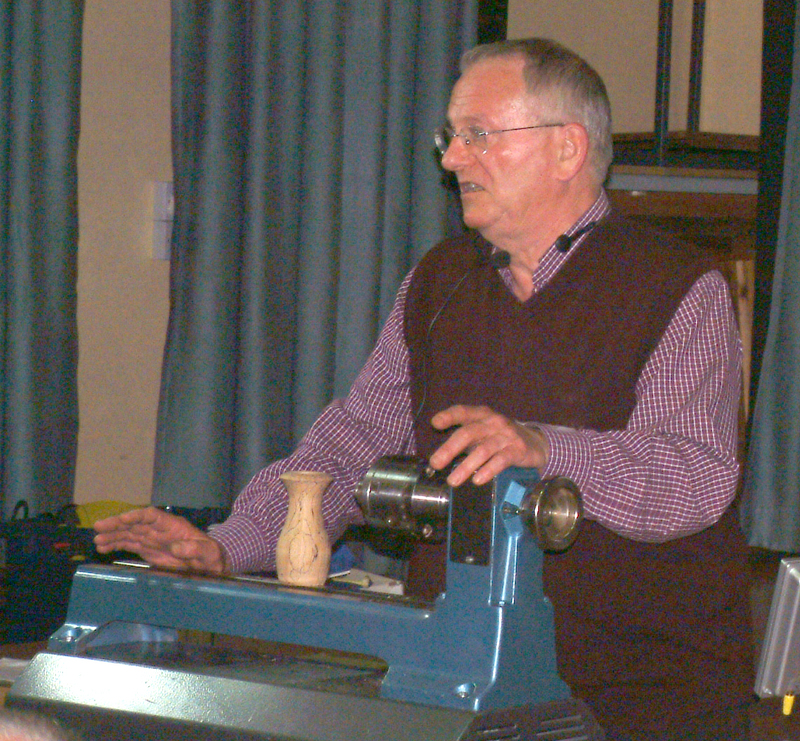 Ian then showed us using a buffing wheel set up on a stabalised blank of quilted poppler. The stabalised wood has had all of the moisture replaced with resin, and so can be quite like acrylic in it’s hardness. Ian had 3 buffing wheels, one with tripoli, one with white diamond, and the last with carnuba wax. Leaving the blank on the mandrel, but slackening it off a little he was able to run it against each buffing wheel in turn, spinning freely. This made it easy to get a good consistent buff all over, whilst having a solid grip on the mandrel. He noted that whilst the carnuba will wear off over time, the stablised wood is sufficiently like plastic that it would not matter. Next he showed us an acrylic blank, this we was going to sand down through the grits to show the finish that acrylic reaches. He warned that you should never sand too fast, acrylic can melt if heat from friction is too high and ruin your surface finish. 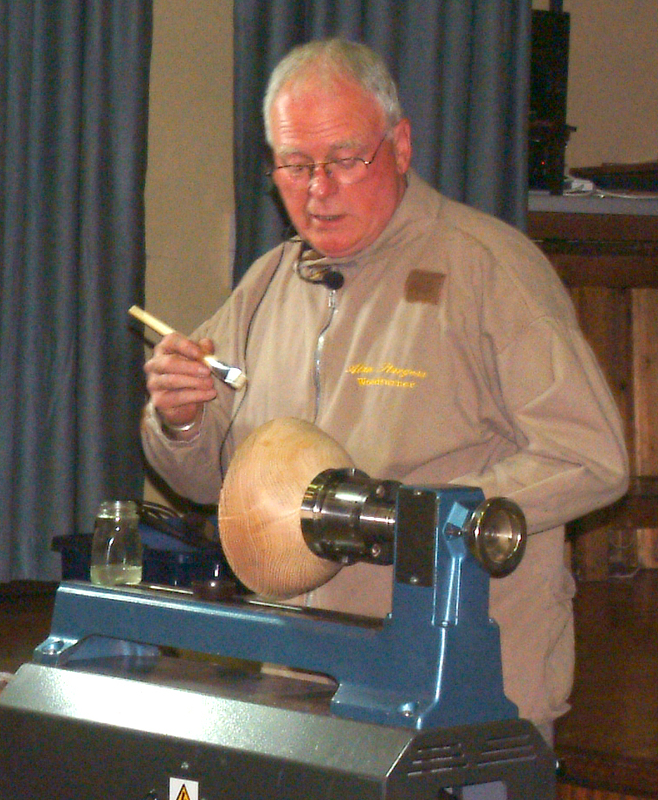 After sanding through the grits he finished on the same buffing wheel setup, though he confessed that with acrylic this was more habit than requirement. Regardless of the material and the finish, Ian likes to apply renaissance wax to the finished assembled pen. Briefly Ian also demonstrated a technique that he personally is not a fan of, but is very popular amongst pen turners called the ‘ca blo’ technique. This uses Boiled Linseed Oil and super glue. First he applied some BLO and buffed with a cloth, then he applied a very few drops of thin ca glue with a cloth, the ca reacts with the oil and sets into a plastic coating. He repeated this process for 3 layers, gently keying the surface between to help the coats. He mentioned that this can be repeated several times to build up a solid plastic coating, leaving it to cure over night to get a really hard finish. This is very much a surface finish, rather than one that absorbs into the wood. 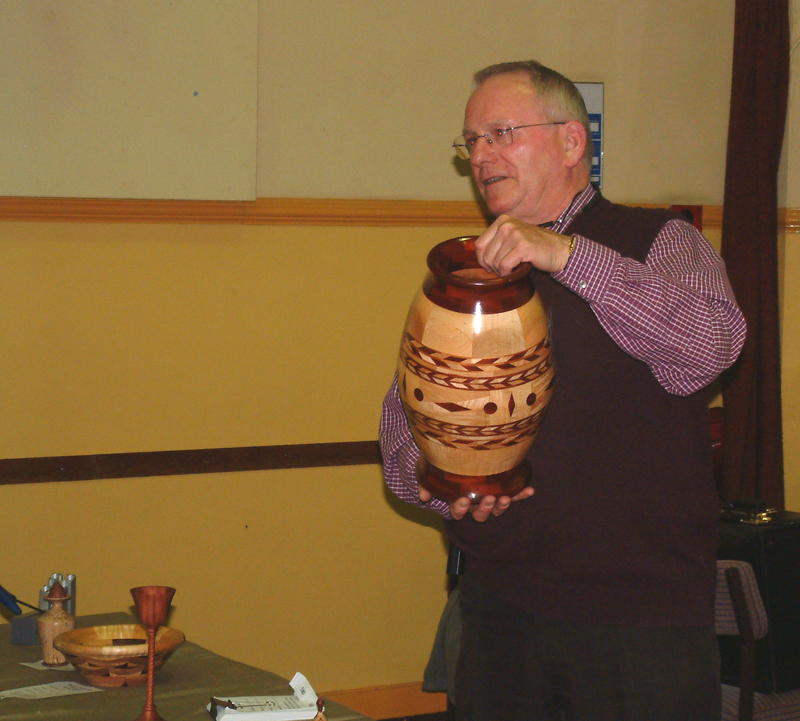 Next up, Alan Sturgess who does lots of Salad bowls and consequently needs a food safe finish, as with Ian, Alan brought some example bowls to pass around to let us get a feel for the finish. Alan suggested with oil finishes not to sand below 240, as burnishing the wood made it harder for the oil to penetrate. He demonstrated using Markoil 82 which is a medical grade oil that is food safe, not tacky and doesn’t go rancid. He suggested that nut oils are also ok, but warned of caution on anything that could trigger a but allergy. When applying the oil, he is sanding and applying at the same time. He applied a coat of oil, then sanded at 240. He even applied oil to the sandpaper before use, as he doesn’t like to start with dry paper. This process creates a slurry of oil and dust, but this prevents dust in the air. He worked his way up sanding and oiling to 800 grit. Lastly he applied a black bison wax to the exterior only of the bowl. 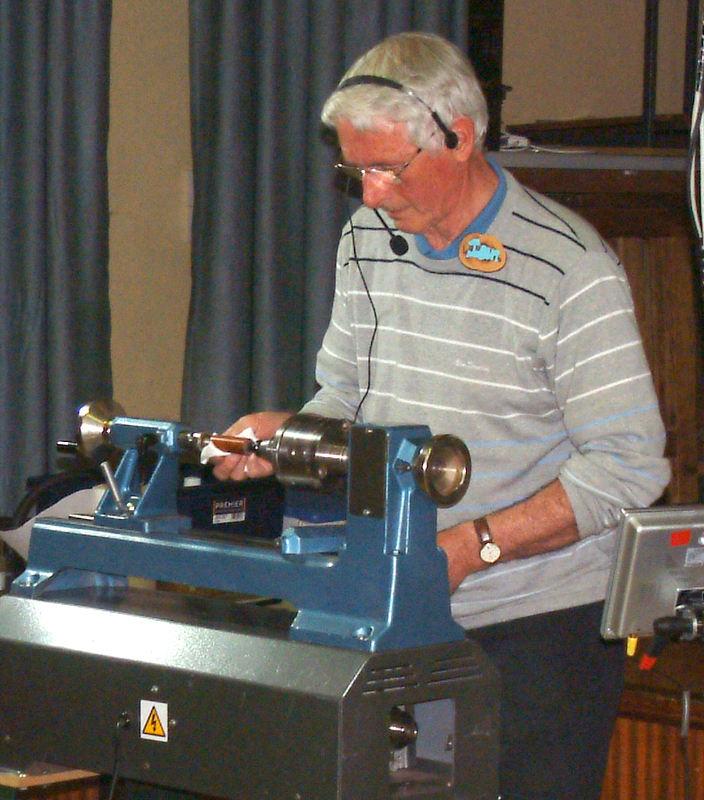 Alan pointed out that oil does not leave finishing mark rings, as can be a problem with friction polish etc, and should be fine in usage needing reapplication approximately once a year. Last up was Chris West, talking about the finishes he uses on Salt and Pepper mills. Again like pens, these need to stand up to considerable handling! Chris commented that for him the finishing starts when he fills any cracks in the wood. First he used melamine lacquer thinned down, as he wanted to achieve a water proof finish. After applying that he moves on to applying a chestnut acrylic lacquer, in horizontal strokes and light coats. Better to apply many thin coats than fewer thick coats. He also ‘denibs’ between coats with 600 grit. After 3 coats with 10 mins between each, he recommends leaving for 24 hours before buffing. Chris normally doesn’t finish the inside of the grinders, although if he is using something like yew, where there is a perceived risk from toxicity, in which case he uses a food safe finish. All in all a very informative evening with some great tips and examples. I thought it was particularly useful to have many examples passed around to show what the finishes look like after use.